Corazón Events, LLC is a full-service event and administrative management company, offering exquisite design and décor as well as corporate event management services. Owner and Event Manager Camilla Dominguez founded Corazón Events in June of 2003 in Los Angeles as a boutique production and event management company. With Camilla’s broad background in production, accounting, design and business management, she was proud to offer sophisticated, custom services to independent productions and events. Camilla’s vision was to connect ideas to people and people to experiences. See recent events in our gallery. Corazón Events quickly became well-known for impeccable organizational assistance, custom design & décor, budgetary management, overall personalization, and impeccable day of execution. Some events have gathered thousands while others served 15 for an intimate dinner at a local estate. Camilla and her team pride themselves on their attention to every detail. Whether it’s a wedding or a trade show, every event is handled with care, creativity, and respect. Camilla and her mother lovingly named her company after the Spanish word for “heart”. Camilla Dominguez is owner and founder of Corazon Events. MTV, Lionsgate Films, Blue Cross Blue Shield, The Learning Annex, Wisdom of the Whole Coaching Academy, Brown Mountain Visions, University of New Mexico, Mama’s Minerals, Cutts Graduate Reviews, The Fiery Food Show, Mountain States Insurance Group, Olay, Brahma Beer, Edible Arrangements, New Mexico Holistic Nurse Network, Sandia Electro-Optics Corporation, et al. See more in our gallery. MTV, Lionsgate Films, Blue Cross Blue Shield, The Learning Annex, Wisdom of the Whole Coaching Academy, Brown Mountain Visions, University of New Mexico, Mama’s Minerals, Cutts Graduate Reviews, The Fiery Food Show, Mountain States Insurance Group, Olay, Brahma Beer, Edible Arrangements, New Mexico Holistic Nurse Network, Sandia Electro-Optics Corporation, et al. 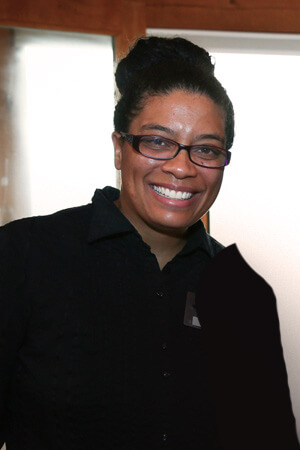 Shantel Riley has worked as an Administrative and Assistant Event Manager for Corazon Events since 2012. She brings years of experience in the food/beverage/hospitality industry along with impeccable customer service skills and a tireless work ethic. Shantel has a love for animals and exploring the outdoors. This kindness shines through in all of her work and is particularly appreciated by clients on the day of their events. Shantel has a gift for making people feel at ease and ensuring their needs are met in a timely fashion whether at the office or at an event. Shantel also enjoys crafting and making pottery work and glass etchings. She and Camilla can design and construct custom favors and gifts to match any of your company or event themes. You will see Shantel do everything from event set up and serving to vendor relations and data entry. Shantel attributes her powerful teamwork skills to her years of Roller Derby and avid bicycling! Need an event planner or wedding planner? Please contact us for a free quote and consultation!